If you have not found the answers to your questions on our product pages, you should find them here. The recommended age for the toy is specified on the product information sheet. The majority of our ride-ons are designed for children aged 1 to 3 and our pedal cars are for children aged 3 to 6. The product dimensions and weights are also specified on the product information page. The recommended maximum weight for the use of the ride-ons is 20kg (44lb). There is no height limit for the ride-ons. The only limit is the age (1 to 3 years). In addition, our pedal cars’ pedals can be adjusted to three positions so that the seating position can be altered along with the growth of the child. The cars from the Race cars and Vintage cars collections are equipped with a seat that is adjustable to two positions. Do you offer any vehicles for children over the age of 6? We currently do not offer vehicles for children over 6 years. Do not hesitate to follow our activity on social media to stay informed about Baghera’s new products. The availability of our products is indicated on the product information sheet below the price. If “in stock” appears, then the product is available and will be able to be sent without delay. Some products can be pre-ordered. The product information sheet specifies the date of the start of deliveries underneath the « Pre-order » button. When a product is pre-order only or out of stock, you can leave your email address in a form on the product information page to be informed directly by email when the product is in stock. All products bought on the http://www.baghera.co.uk site are guaranteed for 12 months from taking possession of your product. This guarantee is only valid in the case of normal product usage and does not cover general wear and tear. Any request to claim on the guarantee must be made in the form of a detailed request via our contact form. Do not forget to give your Baghera order number. How can I get hold of the assembly instructions for my product? The product assembly instructions are provided along with the package on delivery. In the case of loss of the document, you can download it in PDF format from the page of the product concerned under the “Assembly” tab. Do you offer to assemble your products? We do not offer to assemble our products. If you encounter any problems with assembly, please do not hesitate to contact us on +33 (0)1 30 46 93 10 (from Monday to Friday, 9:00-12:30 and 14:00-17:00, GMT+1) or write to us via our contact form. Do not forget to have the assembly instructions with you. Due to the size and the weight of our products, we are not able to offer a gift wrapping service. Do you offer any discounts for multiple purchases? We do not offer discounts for multiple purchases. However, you can benefit from our current offers (free shipping, promotional codes etc.). How do you adjust the car pedals? To adjust the car pedals, you must insert a small screwdriver into the centre of the pedal, in the hole provided, in order to block the axis of rotation of the pedal. Then, use some pliers to unscrew the bolt of the pedal. Repeat this manipulation to fix the pedal to another position. Do the wheels of your products turn? Does the steering wheel work? Our pedal cars and ride-ons are completely functional. The wheels and the steering wheel turn, allowing the ride-on or the car to be steered in all directions, like a real car. All safety guidelines are specified on the assembly instructions and under the “Security” tab on the product information page. These absolutely must be respected to ensure the optimal usage of the toy and the safety of your child. What surfaces can the pedal cars and ride-ons be used on? 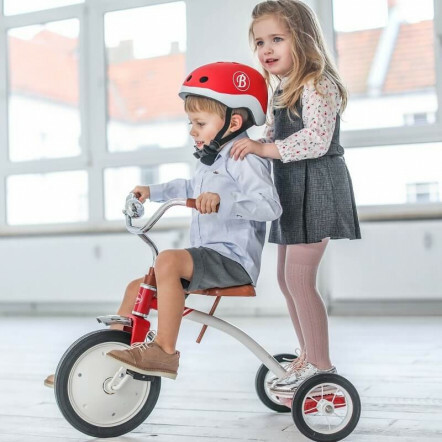 Robust and easy to handle, our pedal cars and ride-ons can be driven on all hard surfaces, indoors and outdoors (wood, tiles, tarmac, grass, gravel, etc.). How can I look after my pedal car or ride-on? Our products are carefully designed to not need any particular maintenance. 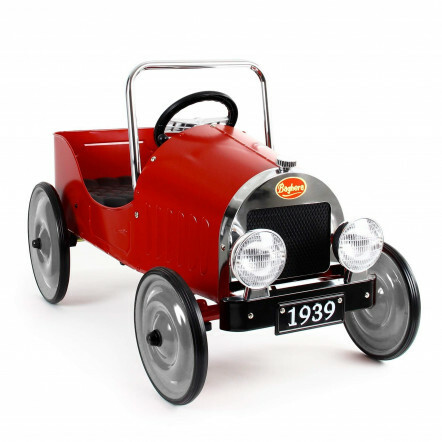 If you do wish to maintain the body of your pedal car or ride-on, we recommend that you use natural products, such as black soap, linseed oil or beeswax. The use of automotive products (polish, wax, shampoo…) is not advisable due to the toxicity of some components for your child. Where should I store your products? It is recommended to store the Baghera pedal cars and ride-ons indoors, sheltered from sunlight and humidity. Our toys are created and developed in France by a talented team of designers. Production is outsourced and entrusted to our partners, subcontractors, in several countries. These are selected with the greatest attention. We particularly want to respect the norms in place concerning security and our collaborators ensure regular inspections and constant monitoring of the toy products. How long do your toys last? Made principally of metal and rubber, our toys do not have a limited life-span and are designed to go across generations. My toy is damaged, what should I do? In the event that your toy has become damaged, we invite you to replace the defective part under the heading “Spare parts” where we offer a number of replacement parts for your ride-ons and pedal cars. How can I get hold of a spare part which is not on your website? If you are looking for a specific part which is not available from our website, please use the contact form to make a request. Do not forget to specify the reference number of the model concerned. Can your products be personalised? You cannot currently choose the type and the colour of parts and stickers for our products. Nevertheless, you can personalise your pedal car or ride-on with our personalised stickers (size 10x4cm) which can be modified on the product page. The personalised sticker is not delivered stuck to the car or ride-on. You can place it anywhere you like on the toy. Please be aware that personalised stickers are not available for dark or black-coloured cars and ride-ons as they are printed on a transparent background with black ink, which would make them difficult to see once stuck to the vehicle. How can I order a personalised sticker on its own? Our personalised stickers are not available as a single product. If you wish to order it on its own, you must add a pedal car or ride-on to your cart and then delete the car from your cart to leave you with just the sticker. If I order a personalised sticker, where will it be when I receive the package? When your order is dispatched, you will receive a confirmation email informing you if your sticker is being sent with your package or separately. In the case of a combined delivery, you will find the sticker where it says “DOCUMENT CI-INCLUS” on the outside of the package. Can I add a personalised message to my order? The http://www.baghera.co.uk website currently does not offer the option to add a personalised message to your order. Nevertheless, please do not hesitate to contact us via our contact form and we will do all that we can to add your message. If you wish to resell our brand’s products and stay in contact with our commercial service, contact us via our contact form. Do not forget to specify the name of your shop, its location and the URL of your website if you have one. Do you have specific prices for professionals? We do offer specific prices for professionals. In order to obtain them, please write to us via our contact form. Do you need to contact us regarding a partnership or an event or media product? Do not hesitate to contact us via our contact form and our marketing team will respond to you as soon as possible. I’m having some problems logging into your website, what should I do? - Your password is incorrect. If you have forgotten your password and you wish to reset it, click “Forgot password?” below the log-in form. A password reset email will be sent to you with a link to take you to a page where you can modify your password. - You do not have an account. Your subscription may not have been validated on our website. If your log-in details seem correct, please proceed to create your account on our website and to fill in the required fields. A confirmation email will then be sent to you. If you still cannot manage to log in, do not hesitate to contact us on +33 (0)1 30 46 93 10 (from Monday to Friday, 9:00-12:30 and 14:00-17:00, GMT+1) or via our contact form and we will do whatever we can to resolve your problem. For security reasons, our sales advisers are not able to accept orders made by telephone. If you encounter difficulties with ordering via our website, do not hesitate to contact us on +33 (0)1 30 46 93 10 (from Monday to Friday, 9:00-12:30 and 14:00-17:00, GMT+1) or write to us via our contact form. I made an error with the delivery address, how can I change it? As long as your order has not yet been dispatched, we can modify the delivery details. In order to do this, contact us as soon as possible by telephone on +33 (0)1 30 46 93 10 (from Monday to Friday, 9:00-12:30 and 14:00-17:00, GMT+1) or via our contact form. How can I get hold of my invoice? In order to obtain your invoice, you must go to the “My account” page then click on “See details” to the right of your order history. You can then print the invoice. I want to pre-order a product. What are the conditions? When a product is available for pre-order, we work to deliver it on the date stated below the “Pre-order” button on the product page. If an unforeseen circumstance delayed delivery, we are committed to warning you as soon as possible via email or telephone. In the case that the product has not been dispatched, you will be reimbursed straight away. However, you cannot add a product to your order. If you wish to do this, we can cancel your order and invite you to make another. I haven’t received a confirmation email for my order. Has it been registered? As soon as you validate your order, you will receive an email confirming it. If you do not see this email, we ask you to check your junk folder (spam). In order to directly ensure that your order has been registered, go to the “My account” heading and check the status of your order. If your order has not been validated, we invite you to place a new one. Where can I get my order delivered to? If you do not wish your product to be delivered to a distribution point close to your home, you must change the post code of the delivery address for your order so that we can suggest other distribution points. When you add products to the cart, you will be able to consult the costs and times of delivery. When your order has been dispatched, you will receive an email to track your package which will also allow you to contact the carrier. Our packages are delivered from Monday to Friday (working days, excluding bank holidays). If you are not home when the carrier arrives, a delivery notice will be left in your letter box. This card indicates the time and the day of the attempted delivery as well as the post office where you will be able to collect the package. You must go there with the delivery notice and a form of identification in order to collect it. Depending on the carrier, it may be possible for the package to be left with one of your neighbours. If this is the case, you will be informed by the delivery notice. The www.baghera.co.uk website accepts credit card payments, PayPal and bank transfers. We also accept local payment methods in different countries (Sofort Banking, Sisal Pay, Ideal, Bancontact Mister Cash, Belfius, Przelewy24). In order to carry out a bank transfer, you must fill in your bank account details on the page displayed after validating your order, as well as the amount and date of the transfer. When we have received payment, we will proceed to dispatch your package. In France, the typical time taken for a bank transfer is 48 hours. What is the cost of delivery for my order? To find out the costs of our different delivery methods in your country, please add the products to your cart. You will then be able to select the country of delivery and see the different delivery methods and costs. How do I use my promotional offer? In order to use your promotional offer, log in and add your items to the cart. Then, input the promotional code in the space provided (in the “Summary” step of the order process). It will automatically be applied. I inputted my promotional code and the reduction didn’t apply, why? I am abroad. Do I need to pay importation tax? All packages sent abroad are subject to VAT and customs duties of the country of delivery. If necessary, you will then have to pay off the VAT on the value of the merchandise and the customs duties. To find out the amount of these taxes, please consult this page. Can I be reimbursed for these customs taxes? We do not reimburse the amounts of the fees imposed by the relevant authorities. As soon as we have dispatched your order, you will receive an email with a link to track your order on the carrier’s website. If you cannot find this email, do not hesitate to contact us on +33 (0)1 30 46 93 10 (from Monday to Friday, 9:00-12:30 and 14:00-17:30, GMT+1) or via our contact form. What can I do if I am not satisfied with the product(s)? You are given a legal period of 14 days, starting from the date your order was received, to inform us of your intention to return one or multiple items. To do this, you can send your request by email to info@baghera.fr, accompanied by one or several photos of the product according to your preference. In the case of reimbursement, this will happen within 14 days following the date when this right was executed. This reimbursement will be done without any extra cost to the client apart from the costs of dispatch and return. In the event of returning a product, please resend the item in perfect condition and in its original packaging, therefore allowing it to be ready to be resold. Where necessary, it must be accompanied by all of its accessories. If the following requirements are not carried out, you will lose your right to product return and the product will be returned to you at your own expense. The returns form is available in our general terms and conditions of sale. To facilitate the processing of your product return, please attach the delivery note to the package. Unfortunately we do not offer product exchanges. However, you can cancel the delivery or return the item(s) you do not want and be reimbursed. You can then make a new order. If we have not answered your question, do not hesitate to contact us via our contact form or by telephone on +33 (0)1 30 46 93 10 (from Monday to Friday, 9:00-12:30 and 14:00-17:00, GMT+1).